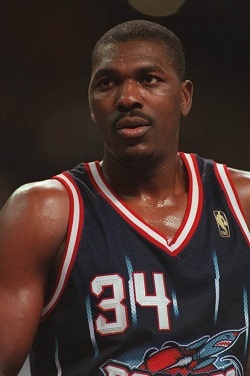 Hakeem Olajuwon’s name has been making its way around basketball circles a lot as of late. With the NCAA tournament underway, the man who stood tall in the middle of one of college basketball’s greatest teams — the “Phi Slamma Jamma” squads at the University of Houston in the 1980s — has naturally been resurfacing in March Madness highlights and retrospectives over the last month. Another wave of Olajuwon nostalgia has been sparked by University of Kansas star freshman Joel Embiid, a projected top pick in this year’s NBA draft who has drawn many comparisons to a young Olajuwon. In a recent Sports Illustrated feature, Embiid talked about watching videos of Olajuwon as teaching tools when he first started playing basketball, including the short documentary It Changed Everything. Around the 17-minute mark, Olajuwon — who was raised Muslim in Nigeria — talks about re-dedicating himself to Islam during a rough patch in his NBA career.